In February 2012 I was contacted by Janice, who was looking for a family member named Julius Thiele, who was buried at Prospect Hill. There was also a Crescentia Thiele in her request. The Prospect Hill book had an entry for a Julius H. Theile, which is below, but no Crescentia. 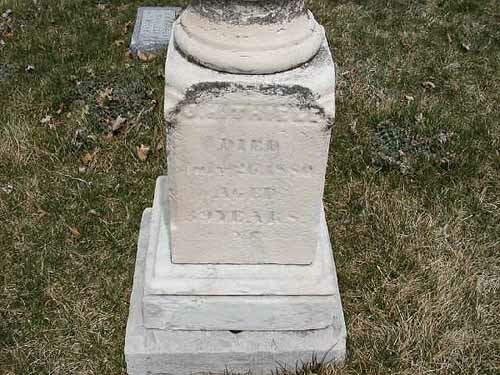 THIELE, Julius - Born: 1842 - Buried: 7/28/1880 - 39y - Lot 98 - Married: 1870; Agnes SATORIUS (b. 1853, Germany). Born in Germany. Julius THIELE was the proprietor of the Tivoli Concert hall and Summer Garden at 903-907 Farnam Street. There’s a reference to Julius Thiele and Tivoli Gardens in a book called “Omaha Memories,” by Edward Morearty. He states that Tivoli was in its heyday from 1881 to 1886, so it’s probably been gone for well over a century. 9th and Farnam today is right in the middle of ConAgra’s Corporate office complex. Edward Morearty's "Omaha Memories" is a fun book to read, if you're an Omaha native. I had no idea we had ever had a concert hall and garden at 9th and Farnam, because by the time I was growing up in the early 60's the area was covered by warehouses, and the district was called Jobber's Canyon. Since the Prospect Hill book said J. H. Thiele, and I had found a Julius Thiele reference in the "Omaha Memories" book, I assumed this was the right Thiele. There was no Crescentia listed, but information like this is not always complete. Janice emailed me back the next day to tell me she finally found her Julius Thiele in the Wolf's Omaha Directory for 1878-1882, along with the other Julius. Her Julius is the tailor mentioned, and she was sure of this because she had heard he had been a tailor. Crestentia was his second wife, who carried on his tailor business until she died two months after Julius. Thiele, Julius, musician, res. 84 Jones St.
Thiele, Julius H., merchant tailor, deals in clothes, cassimeres, vestings, etc. 484 13th st. Res. 747 17th St.
Who would have thought there were two Julius Thiele's living in Omaha around the 1880's? It's precisely this type of confusion that causes genealogists headaches. I'm now wondering if the musical Julius is not buried at Prospect Hill, and the authors of the PH book thought Julius the tailor was Julius the musician. I've not photographed any other marker with Thiele on it at PH, so it's possible he's not there, or the musical Julius' marker is one of the unreadable ones, or their graves are simply not marked. The good news is that Janice found the right information thanks to resources on the Internet. City Directories are a mine of information because most people aren't trying to hide their location or occupation, though there is always going to be someone that was trying to hide and gave false information, or none at all. Janice also let me know that her family was related to the Warren Buffett family through Sidney Homan Buffett, of which there are a lot of members buried at Prospect Hill.